A local resident for over 20 years, Kate Sheridan is well and truly an East End native. A graduate in accessory design, Sheridan has been involved in retail in various ways, eventually specialising in quality leather goods. 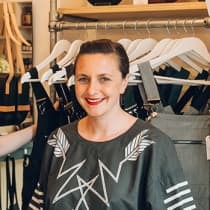 The solo Kate Sheridan label developed from a mainly online platform, with products sold in boutiques and on her popular Broadway Market stalls, until demand led them to consider a permanent retail space. Now with a design studio in store, Kate Sheridan stocks her own womenswear and accessories line alongside local talent and established designers. "We have our design and making studio right here in the store, so anyone walking in can see us in the process or creating something. In addition to our own designs we also stock products from a variety of local crafters, small independent companies and plenty of our talented friends."